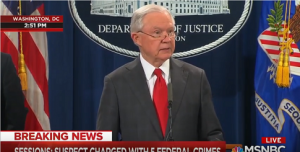 Attorney General Jeff Sessions announced Friday afternoon that the suspect arrested for allegedly sending suspicious packages around the country faces up to 58 years in prison. "[The suspect] has been charged today with five federal crimes, including interstate transportation of an explosive, illegal mailing of explosives, threats against former presidents and certain other persons, threatening interstate communications and assaulting current and former federal officers," Sessions said at a press conference. "For these charges the defendant faces up to 58 years in prison. These charges may change or expand as the investigation proceeds." Authorities initiated an investigation earlier this week into who sent suspicious packages to prominent Democrats and critics of President Donald Trump, including billionaire liberal activist George Soros, actor Robert De Niro, Barack Obama, Bill and Hillary Clinton, Joe Biden, former Attorney General Eric Holder, Rep. Maxine Waters (D., Calif.), and former CIA Director John Brennan. As the week went on, packages were also intercepted before they reached Sen. Cory Booker (D., N.J.), Sen. Kamala Harris (D., Calif.), former Director of National Intelligence James R. Clapper, and Democratic donor Tom Steyer. The package addressed to Brennan was delivered to CNN's office at the Time Warner Center in New York City, forcing the network to evacuate the building. Earlier Friday, FBI agents arrested 56-year-old Cesar Sayoc in Florida for allegedly sending the packages containing parcel bombs. After the arrest was made, Trump denounced such "terrorizing acts," saying they have no place in the United States. Sessions similarly stated political violence is "unacceptable." "Political violence or the threat of violence is antithetical to our vigorous system of self-government. It is a threat to that respect for law and process that allows our people to accept legislation, elections, court rulings with which they do not agree," he said. The attorney general made it clear the defendant should be treated as innocent until proven guilty, but said he wants people to recognize that the administration will not tolerate threats or violence. "I want to reiterate that the defendant in this case is innocent until proven guilty, but let this be a lesson to anyone, regardless of their political beliefs, that we will bring the full force of law against anyone who attempts to use threats, intimidation and outright violence to further an agenda. We will find you, we will prosecute you to the fullest extent of the law," Sessions said.